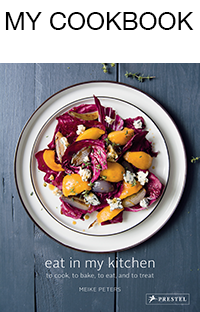 I feel like a crisp, nourishing winter salad and find my inspiration in Bavarian cooking. 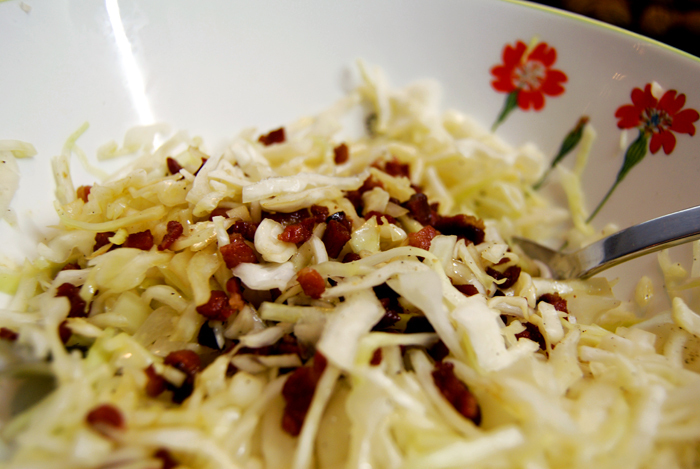 White cabbage – the German Kraut – is the answer to my needs. A big head of cabbage has been waiting in the fridge for a few days and its time has come! A few years ago, my mother told me about a Bavarian salad made of raw white cabbage and fried bacon deglazed with white Balsamico vinegar. I made it just a few days after she told me about it, impressed by its simplicity but mainly by the taste, and it became one of my favourite winter salads, an absolute classic. The fried bacon juices and the white Balsamico create a great dressing, not too heavy but rich enough for the kraut. Good and solid Bavarian food! I chop 500g / 1 pound of cabbage very thinly and mix it with 1 1/2 teaspoons of salt. 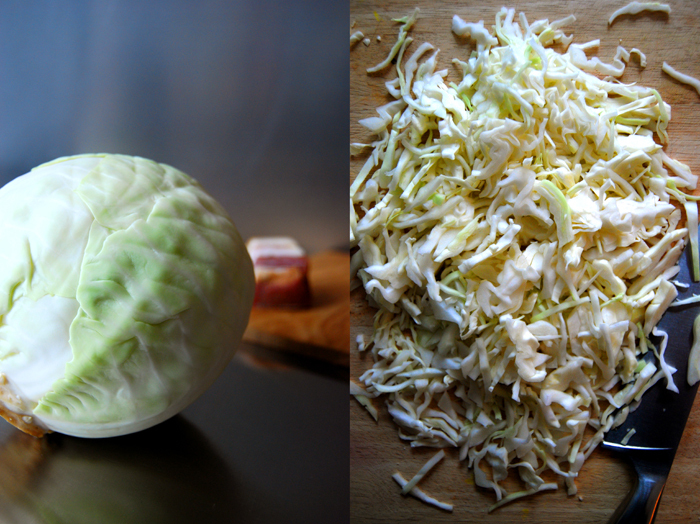 I rub the salt into it with my fingers which softens the cabbage’s texture. It needs to sit for 15 minutes, so I fry some bacon next (around 100g / 3.5 ounces). I cut the bacon into very small cubes and fry them in a small amount of oil. When they are golden brown and crisp, I deglaze them with some white Balsamico vinegar, enough to have some liquid left to pour over my cabbage together with the bacon. I add some olive oil (2-3 tablespoons), more vinegar if necessary and season with salt and pepper. I have my salad with some bread and cheese, an easy but tasty lunch – stuffed with vitamins!